His father, Gilbert, was born in 1876 on Gunder Sorenson’s farm. His mother, Anna Hansen, was born on a farm outside of Little Falls, Minnesota in 1877. His Dad was a strong, husky Norwegian farmer of medium height, his Mom a tall, strapping, big-boned Danish woman. 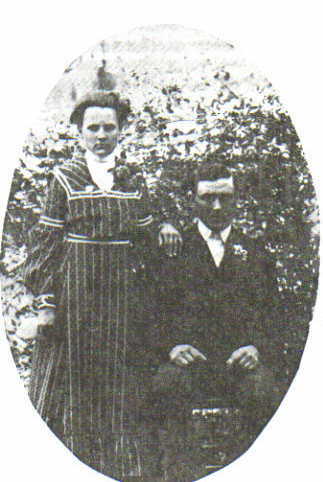 They married in 1907 or 1908, probably in the Little Falls area, as there is no record of their union in the Long Bridge church records. They settled on the eastern quarter of the Gunnard Sorenson farm. On April 2, 1915, their fifth and youngest child was born, Albert John Sorenson. Mrs. Lyng proved admirable as midwife. In retrospect, it is likely that Gramps was born a day late (April fool’s would have been more appropriate!). Here is a picture of Malla and Alfred Flan’s place. The barn and house were located near Little Sauk. They had no children. They used to take care of Janice. Gramps recalls little of his early years. As a youngster, he was told that at night, he would get restless and make sounds like a locomotive, no doubt mimicking the local freight train that whistled distantly past the homestead each night. While civilization had clearly arrived by now to this part of Minnesota, Gramps still remembers the wolves howling at night in the winter. They hunted in packs, were afraid of nothing but fire, and ensured that the kids stayed inside after dark. Their fears were more likely due to the stories that their father told them of his younger days, as the wolves had been largely hunted into oblivion. It was much more dangerous to be a chicken than a little boy, as they fell prey to foxes, skunks and even hawks that would swoop down and soar off with them. The excess eggs collected were traded for groceries at Undom’s store (later taken over by Geolina and Jake DeLong). 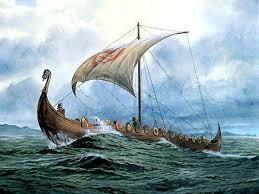 Until the age of five, Gramps spoke a mixture of Danish and Norwegian. This was the first language of the household, and church services were still conducted in Norwegian. His first exposure to English was at school in the first grade. When it was time to start school, Al’s Dad was off building a house for John and Gustie Hansen. Gramps walked up to the school, felt faint of heart and ran for home. By the time his Dad got back from Little Falls, it was decided that he could wait another year to start school. The Sorenson children walked a mile to the District 35 schoolhouse. They walked to school regardless of the weather. After a snowstorm, Gilbert, the oldest, would ‘break the road,’ making a path through the new-fallen snow; the younger children followed. When he was older, in the seventh grade, he inherited the job of getting up early, gathering twigs and wood in the forest, and starting a fire at the school. For this he was paid twenty cents a month. Gramps claims that he took advantage of his position as the youngest; he was a little more than spoiled by his Mom and sisters. He was extremely shy (bashful) away from home however. Gramps held tightly to his mother’s hand when crossing the street almost to the age of ten. He only went to town two or three times a year. His Dad would buy a nickel’s worth of candy for all the kids. In junior high school (Havermill in Bancroft, WA) he would blush at even the thought of a girl. Despite this, the self-described “little hell-raiser” stood a chance. From the field hands, especially Kenneth Mann, he learned the basics of swearing. From the age of five, he could out-cuss his playmates, at least until his God-fearing mother caught wind of his language! Life at the Sorenson farm, filmed in 1968 by Geri Sorenson. The Sorenson family had a strong religious tradition. 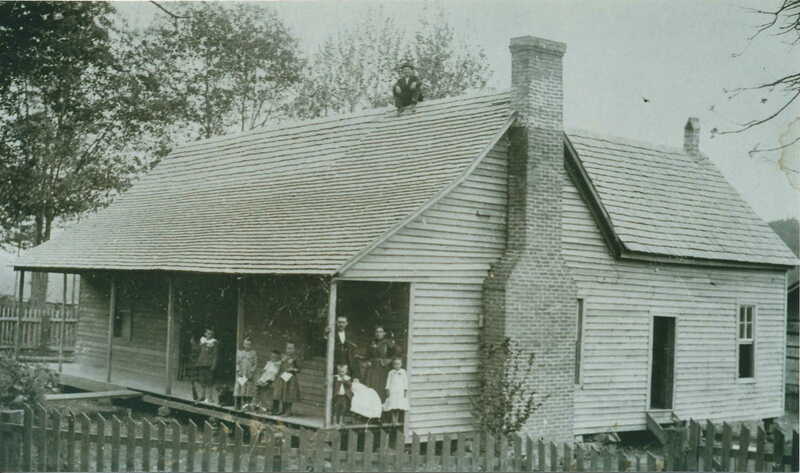 Gunnard Sorenson, Al’s grandfather, donated land for the construction of a small church in the 1870’s. While this church had fallen into ruins by the time Gramps came along, the family attended Long Bridge Lutheran Church, four miles up the road. Each Sunday the kids attended both Sunday school and church services. When the roads were clear, they rode up in a Model T ford. In the winter, a team of horses was hooked up to the sled. Gilbert stood up on the front and bore the brunt of the cold Minnesota winter, where the thermometer could dip to forty below zero. Anna and the children sat in the back, in the grain box, wrapped up in blankets. The children attended catechism for six weeks each summer. Gramps walked the four miles each way, since the horses were needed to work the fields. He dreaded these classes, but there was no avoiding them. Cora Flan was their teacher before they attended at Long Bridge (she was at Korten’s school). Gramps got in trouble one day at church. He was seated next to a friend, George Thornblum, who had a cap gun in his pocket. Gramps reached into his pocket and pulled the trigger. The kids were quiet, but the smoke coming out of his pocket gave him away! They stopped at Coeur D’Alene first. Anna’s half brother, Nels Walters, worked in the sawmill. Gramps and Len stayed there for a couple of weeks while the rest of the family went on to Spokane to find a place to live. Anna’s sister-in-law, Gustie Hansen (her husband, John Hansen, had passed away in Minnesota), put up the family. She already had a household, with seven children (Myrtle, Eva, Harry, Lester, Stella, Dorothy). Gilbert found work in a sawmill and the family settled down. It was in Washington that Gramps first took up sports. Everyone (the city boys) played baseball except him. He would sit and watch the others play. Being a little guy, he was never picked, until one day the team needed a second baseman. The best player, one of the captains, asked if he could throw the ball. He had never touched a baseball before, but he picked up the ball behind second base and rifled it home, right on the money. From that time on, he was always included in the game. When he started playing at school, he played first base and outfield. He worked on his curveball with Louis Deluca, but never pitched as a kid. Gramps also played basketball on the junior high school team. He had little to say to his teammates when he was on the bench, but played with a vengeance. His fondest memory is when he shot the winning basket in the city championship game (this in his first year of organized play). His teammates carried him off the court on their shoulders. His embarrassment was further compounded when one of the prettier girls at the school stopped to tell him hello the next day! It was while playing basketball that Gramps broke his nose for the first time. He raced down the court and tossed in a lay-up. Unfortunately, he forgot that the basket was mounted on a cement wall and crashed face-first into the wall. The second time he broke his nose, he was crank-starting his Model-T ford at the farm in Minnesota. The car back-fired and the crank hit him square on the side of his nose. The final time, he was playing hockey on the lake. Elmer Johnson was playing goalie with a big stick he had found in the woods. As Gramps barreled in on goal with the puck, Elmer cracked him, right in the nose! By this time, Gramps was unable to move any air through his nose; he could only breath through his mouth. This in no small measure likely contributed to his emphysema later in life. Gramps was never too fond of school. He excelled at arithmetic, but was interested in little else. He loved to read westerns. He was the eighth grade checkers champion. His formal education stopped with the ninth grade at Havermill. Gilbert Sorenson’s work at the sawmill was not as steady or financially rewarding as he had hoped. The country was entering the Great Depression. In addition, he started going lame in one leg due to back problems. Thus in 1931, the family headed back for Minnesota, less Gilman and Alice. Carrie left a boyfriend back in Spokane, and headed back the year after. Here is a picture of Grandma smoking a corncob pipe with Uncle Fred at her side. This was probably taken around 1932 when she lived and worked with Fred. Grandma would have been sixteen at the time. We were all young once! Wedding of Leonard Sorenson and Viola. 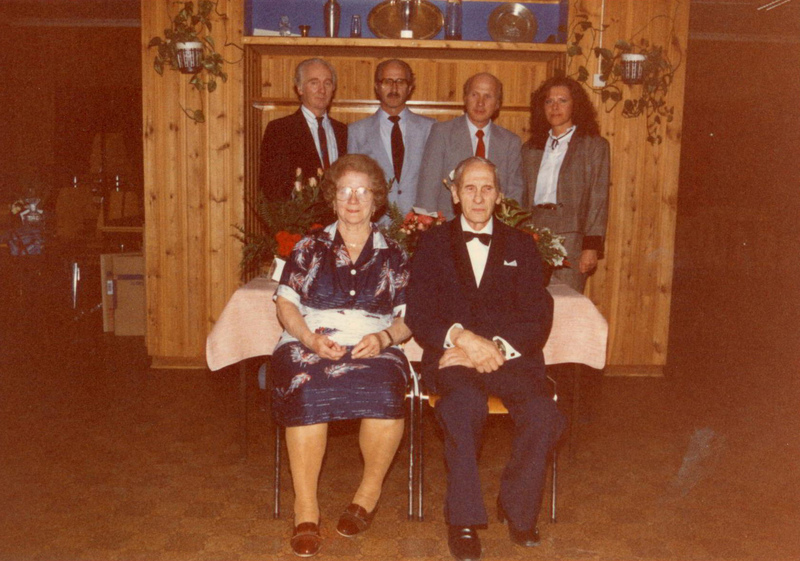 Grandpa Albert is top right, Viola’s sister lower right. After two weeks, we headed back. The first night we clambered up onto a freight train. We waited all night without moving an inch. Early in the morning, the place was crawling with wardens so we snuck down again. Because they were closely watching the trains, we walked a few miles to the outskirts of town and hopped a boxcar. 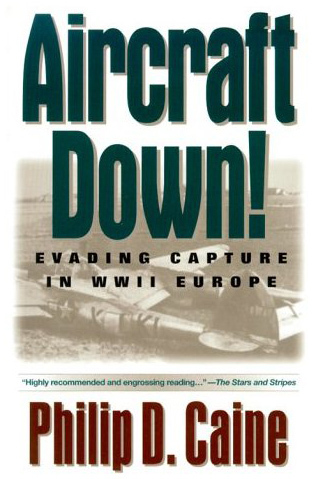 “It was moving pretty fast, and with our suitcases and all we picked a car near the front. We were too close to the locomotive. We had to climb on top and when we got off we were covered with black soot from head to toe.” (It wasn’t the safest way to travel. Gramp’s best friend, Butch Sletta, was hopping freight trains out west, looking for work. In Idaho, he lost his grip and fell. He lost the better portion of both feet and would have bled to death if his buddy hadn’t been there to help him!) “When we got to St. Cloud, we had enough money left over for some sweet rolls. Someone noticed us and bought us a cup of coffee. Outside of town, we tried to hitch. It got dark though, without us getting picked up. A police cruiser stopped and asked us what was up. We explained that we were trying to get back to Sauk Centre and couldn’t get a ride. He told us to hop in the back, brought us back to the station, got us each a mat to sleep on and locked us up for the night. He let us out in the morning and we were on our way. 1935, Al and Gladys Sorenson hanging out with friends. Geolina Sorenson right, Ellen Eklund. It was shortly thereafter that Gilbert’s condition worsened. Up until then, he had been able to walk with the help of a cane. One evening, during the three-quarters of a mile walk to Uncle Fred’s place, his second leg went lame. “About a year after we got home, Dad went to the University of Minnesota on account of his back.” It was with the help of the County Commissioner, Bill Halpern, that he was treated, They did surgery on his spinal cord and he became paralyzed from the waist down. I guess it was experimental at the time. I remember all of the doctors coming in a large group. One doctor would stick pins in him, starting below and moving up, until he felt it. It was the cruelest thing. After a year, he came home and Mom took care of him.” On an historical note, Gilbert was probably one of the first patients who had spinal surgery in the world. The University Minnesota pioneered spinal surgery. At the time, no one even knew that disk disease even existed. Were his surgery to take place today, it would be considered routine. With their father’s paralysis came added responsibilities on the farm. Al and Len were now in charge of running the place. Neither of them had much experience in the fields. They were up early to milk the cows (or at least Gramps was; Len preferred to sleep in). They were paid fifty cents a day, all Gilbert could afford. They hadn’t ever sowed corn or even plowed before. Al more or less taught himself. One day, his Uncle Fred asked him to check corn for him. Gramps had never done this before, but said he’d give it a shot. When all was said and done, Fred exclaimed, ‘Why it’s as straight in one direction as the other!” This was important, since there were no herbicides available and corn needed to be cultivated both lengthwise and crosswise. While one might think Gramp’s motivation was altruistic. In fact, he was a little more than interested in Fred’s hired help, Gladys. When I was a boy, I once found a letter in an old trunk on the farm. Grandma wrote it to Gramps. It was short and sweet… Tonight I am going to kiss you, right under your nose! I showed the letter to Gramps… he blushed a deep crimson and tore it up! There were no milk delivery trucks at the time. The most efficient way to transport the separated cream to Little Sauk was though the use of a two-wheeled cart with rubber tires. Gramps would hook up the team and deliver the cans to the creamery in Little Sauk. He tells of racing the freight team home from Little Sauk the four miles down U-trail road. If the freight train pulled ahead, the soot and smoke bothered the horses such that they all sometimes ended up in the ditch. He usually beat the train home, the horses going at a rapid trot. With of the passing of school days in Spokane, so passed the opportunity to play organized sports. Nonetheless, every Sunday when possible the local Kandota Township boys would organize pasture pickup games. It was there that he began to pitch, alternating pitching and catching with a talented pitcher named Zimmerman. While not something mentioned, I wonder how many ‘cowpies” Gramps slid through making his plays.., they were sharing the field with the livestock of course! In 1932, Gramps actually had the opportunity to play pickup ball with the great Ted Williams (see story)! What do you think of this shot with Grandma? This was probably taken in 1939 or 1940. What a doll! Al and Gladys’ first cow was a gift from Al’s mother, Annie Sorenson. 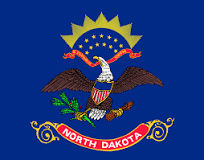 Albert and Gladys were married January 8, 1938 in Fargo, North Dakota in a civil ceremony. They initially rented the Bozart place, then moved out to the farm on Long Lake in Birchdale Township shortly after the birth of their daughter, Janice. Uncle Fred joined the young family. The first year was spent picking rocks in the fields, no crop was made. They started with three milk cows, two of which belonged to Grandma, and a third which Gramp’s mother Anna gave them as a wedding present. Gramps bought a team of horses and three more cows. They continued to scrimp and save, and with the help of a loan from Bill Halpern, purchased the farm two years later. They formed a partnership with their Uncle Fred, who had lost his portion of the Sorenson family farm to the bank. During their first winter at the farm, Grandma went outside to visit the outhouse prior to retiring. It was a cold, blustery night, and no sooner had she walked outside that she burst in through the door, hopped on Gramp’s lap and exclaimed, “There’s a man out there.” Gramps didn’t have a gun, and it was not uncommon for vagrants to be wandering about looking for food (it was still the Great Depression in central Minnesota). However, the “man” turned out to be a stiff pair of long johns, frozen on the cloth’s line. Gramps never let her hear the end of it! During World War II, the farmers responsible for feeding the nation were exempted from military duties; Gramps was no exception. Times were extremely difficult, and money hard to come by. Whereas Gramps lived for his baseball, most of the players in town left for the war and the leagues were discontinued. While the couple loved to dance on the weekend, they quit in order to save money. Gramps vividly remembers one exception, when they decided to treat themselves. Not having a cent to his name, he robbed Jan’s piggy bank of a dime. This was given to the accordion player at the dance, who was more than grateful for the dollar or two he garnered from the dancers. Gramps isn’t certain if that dime was ever replaced. In the winter of 1942, Anna Sorenson was walking to the barn to fetch water from the well. The snow was packed high, and she slipped off the path, apparently hitting her head. She was left paralyzed on her left side, unable to fend for herself. From then on, Len and Gramps took turns taking care of their parents, Len in the winter and Gramps and Grandma in the summer. The house on Birch Lake was cold and drafty. “Len and I took turns taking care of them, for six months at a time. Our house didn’t have heat so we took care of them in the summer (Len occupied Gilbert and Anna’s house). I had to turn Dad four times a day. I remember threshing, running home one mile to turn him at lunch, running back that mile and going back to work.” During the summer, Al and Gladys slept upstairs so their parents could rest comfortably down. A hole in the floor allowed his folks to ring a bell at night in order to get their assistance. Gladys’ Mom, Annie, often came over to help for weeks at a time. This was especially useful after Larry was born, since he suffered from petit mal epilepsy. Grandma recalls episodes when he had spells and fell in the lake, or once fell down the cellar stairs. Luckily, Olaf was there to catch him. One day, Annie fell down the steep stairs and broke her ankle. Gramps and Grandma were left with three invalid parents and two small children to care for! It was as trying a time as they could remember. 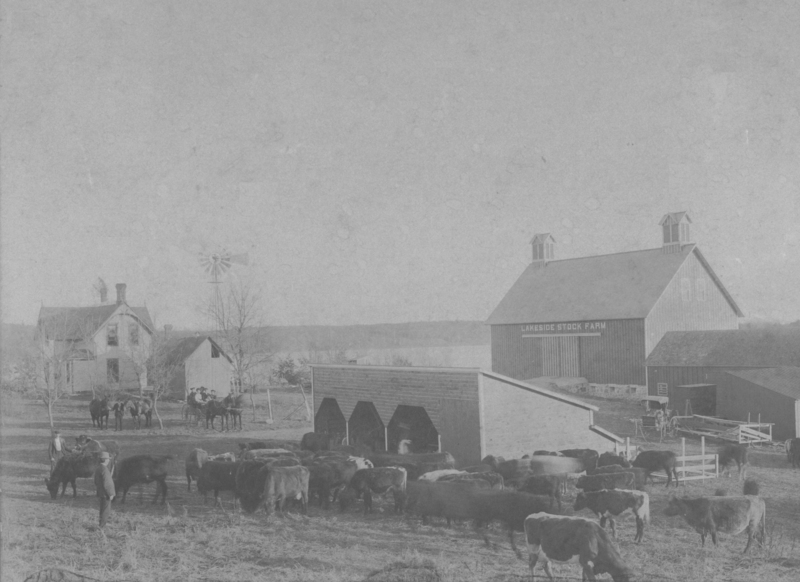 This Photo shows the farm shortly after the time it was built by a group of investors. The bank took over the note after bankruptcy. The Long Depression was a worldwide price and economic recession, beginning in 1873 and running either through the spring of 1879, or 1896, depending on the metrics used. It was the most severe in Europe and the United States, which had been experiencing strong economic growth fueled by the Second Industrial Revolution in the decade following the American Civil War. Gramps’ Uncle Fred lived in his own room downstairs. As mentioned, he had lost his portion of the Gunder Sorenson family farm to the bank. This was in no small part due to the fact that he lost a barn to a tornado in the late twenties, the same time when Long Bridge Church was destroyed. The drought of 1933 and 1934 made it more difficult. The corn was so short that they harvested it with a wheat binder. The grasshoppers wreaked further havoc with what little hay there was left. The men would go out into the fields, spreading poison. They were able to save most of the wheat. They harvested it as quickly as they could; one could see the wheat stripped bare along the periphery of the field. If the grasshoppers had come any earlier, the crop would have been lost. When feed was low, Fred had to buy some slough-hay for his cows. It cost him twenty dollars; as much as he got for selling one of his cows. Fred Sorenson was a coarse man, an old bachelor, and Gramps recalls he would come to dinner with manure on his hands. He was a hard worker, but relied on Gramps to keep the machinery in order. “He’d argue his fool head off,” Gramps would just get up and leave the room. He never really got along with anyone except Gramps and Grandma. Fred went to see Dr. Cleaves when he got sick. He had surgery, but the doctor didn’t say anything to either Fred or Gramps. Gramps was up at the hardware store talking to the owner. The owner was gossiping about a man who had been opened up and was just full of cancer. He was talking about Uncle Fred of course, and this was how both Fred and the family found out about his condition. The doctor never said a thing. Fred went home to die in his own bed. One day he called Gramps into the room. He had an impaction, which was causing him excruciating pain. Gramps helped him out, in the same way he cleaned up his emesis when he threw up, without complaint. At the funeral, the minister took Gramps and Grandma aside, and told them how grateful their Uncle was for the care he received. His greatest fear had been that he would die without anyone to help him. 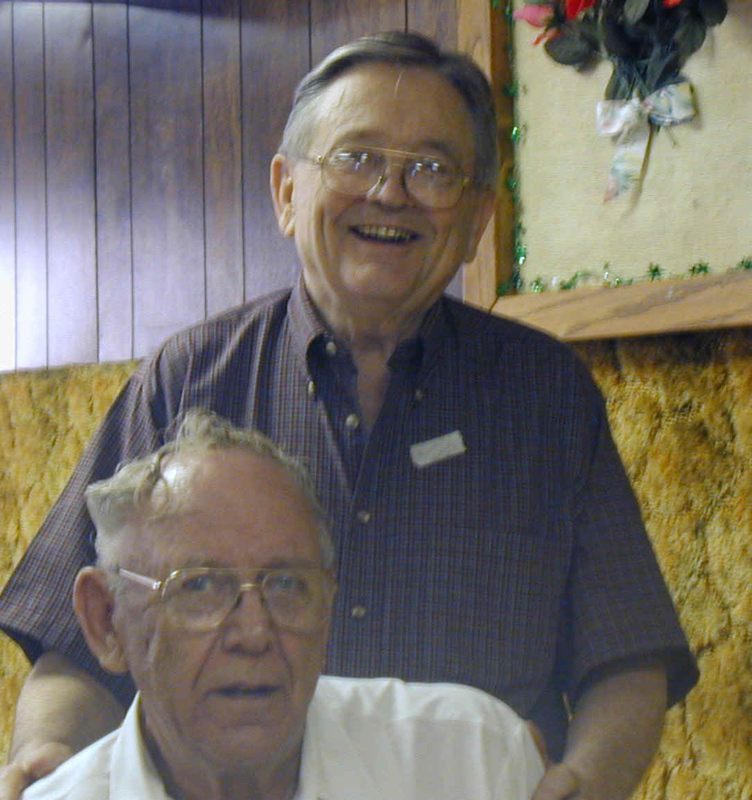 Fred gave his share of the farm to Jan and Larry upon his death in 1954. Gramps was a star for the Sauk Centre baseball team, this article references his strong pitching. Even after the war, times remained tough for the Sorenson’s. Gramps would drive the kids into town so they could see a movie. In order to save gas, he would wait for them in the car until the show was out. While this doesn’t seem like much now, keep in mind he often did this in sub-zero winter temperatures. Being an avid sportsman, he loved to ski and ice skate. When driving into town with another couple, the men sometimes switched off skiing behind the car, both to and from town. While the trip into Sauk Centre was generally navigated without mishap, after a few beers the men invariably “crashed and burned” on the way home! As Jan and Larry grew older, they too took their turns skiing behind the car. Gramps and Grandma still remember looking back, seeing Janice being pulled headfirst down the road …. “I don’t know why she just didn’t let go.” Another time, Grandma looked back, only to identify her feet sticking out of a snow bank. The kids were generally towed behind the car every Sunday. Gramps was also a good ice skater, and both Jan and Larry received skates as they grew older. Fierce hockey battles were fought on the lake. Janice remembers once, when bringing a girlfriend home with her (Germaine), how Gramps was showing off, skating backwards. His skate caught in a crack in the ice and he went flying! That taught him a lesson… for awhile. In 1948, Gramps purchased his first tractor at auction for $780, a John Deere H (he later sold this for the same price on trade for a John Deere B almost ten years later!) Uncle Fred made the comment, “Oh, they’ll (tractors) go out and the horses will be back.” Over the years, additional machinery was purchased cheaply at auction in southern Minnesota, Dakota and even Iowa. As Gramps rightly figured, it remained forever more efficient and economical to use machinery in the place of draft animals. Over the years, Gramps figures he spent as much time picking rocks out of the field as he did farming. Each winter brought up more rocks, a virtual crop in itself. Larry preferred picking rocks to milking cows, so he was the most prolific rock picker of the family. Each year, Gramps planted corn, oats and hay on about a hundred acres. He cultivated not only his own land, but also rented land each year. This was done not with an iron-clad contract, but rather with a firm handshake. Gramps bought his first hay bailer from Jake Delong in the early sixties. The herd of dairy cows gradually expanded to twenty-seven, all of which were milked by hand twice a day. The cream was separated from the milk, and delivered to the Little Sauk Creamery three times a week. The milk was left for the calves and pigs. Gramps and Grandma got all the butter and ice cream from the creamery. There were times when they ran short and churned their own. Gramps remembers his Mom, Anna, sitting in a stool, churning butter alternatively with her right and left hands. It was arduous to work the aged cream into butter and buttermilk. Even I can remember making butter as a child on visits to the farm. Grandma would give me some old cream and a jar and I would start shaking. After a couple of times, the novelty disappeared. Around 1950, Al Blank began driving the truck that picked milk up in ten gallon cans from the farm. It was only when Janice left home for the cities in 1958 that they purchased their first milking machine. Gladys Sorenson hanging clothes out to dry on the clothes line in front of the house. One of the advantages of living on the farm was the availability of rich land for gardening. The Sorenson family planted a garden every year. It wasn’t just for fun however. The primary staple crop was potatoes. Jan remembers plucking potato bugs from the plants and dropping them in a kerosene can (Uggh!). The garden also yielded carrots, onions, tomatoes, green beans, peas, radishes, squash and pumpkins. In later years, Grandma also planted strawberries and raspberries. The farm and its woodlands would yield a variable crop of wild strawberries, blueberries and chokecherries, which could be made into jam with the appropriate amounts (massive) of sugar. One mustn’t forget the annual crop of rhubarb. Grandma’s gardens were beautiful, the rows free of weeds and the crop bountiful. It was no small help that the garden was fertilized with fresh cow manure. Canning ensured that there was always fresh jam to last the winter (raspberry jam is still my favorite). Given the ready availability of fresh chicken, and an occasionally slaughtered pig or cow, the family ate well, regardless of how much money there was in the bank. It was difficult for the kids to make extra money. Jan and Larry would get money for milking the cows. During the fifties, for two or three years running, they planted a large cucumber patch. Larry and Jan were fully responsible for the planting, weeding and picking. They delivered small cucumbers for pickling to Grey Eagle. When Larry collected enough money to purchase a new saddle, he quit. Mom (Janice) kept working… she used her money to buy clothes. Larry used that saddle for a pillow at night. The kids loved to ride horseback. The horses were not the best trained, however. Janice took her horse down to the slough to drink; the horse laid down in the water, rider and all. 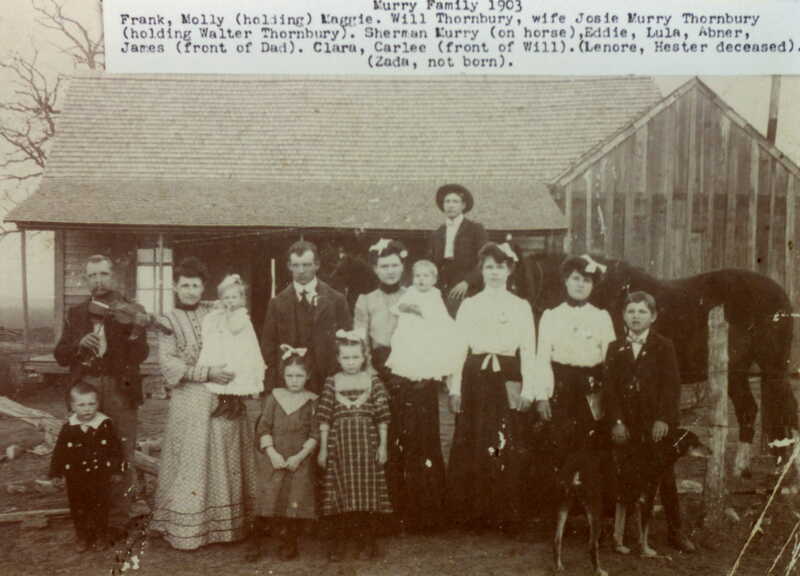 Their first horse, a sorrel named Sandy, was struck by lightning. Larry’s horse was Thunder, Jan’s Cindy. They also owned a horse named Queenie at one time. Larry would ride Thunder to the red schoolhouse at the corner and let the horse go. The horse would find its way home and Grandma would put him in the barn. When Gramps gave up baseball, he and Grandma took up bowling. Gramps would go practice while his grain was being ground at the co-op. Grandma and Larry entered a doubles tournament when Larry was in the eighth grade, which they won. Larry took the prize money and went down to the cities to see his cousins, Dean and Gordie; Grandma says she never saw her share of the money; I’m sure she didn’t begrudge it. In the mid-fifties, Gramps and Vic Sieben competed together in the St. Cloud invitational. Gramps, who then carried a 161 average, bowled a 681 series. They won first place in doubles. In the last frame of the last game, he was left with a 6-7-10 split. Vic Sieben told him that he needed to pick it up to win all-events. He did, “You should have heard all the whooping and hollering!” Gramps took first in a field of 25,000, scoring the highest series of his life! Gramps took up golf in 1956, ‘I always wanted to be able to hit that little white ball.” He used to practice at home. He had a bag of balls that he would hit out into the pasture. He’d then do his best to retrieve them. It wasn’t uncommon for us kids to find long-lost balls years later (perhaps hidden in the woodpile, or maybe lodged in a dried-out cow pie). When the balls were too cut up for practice, Gramps (or Jan) would hit them out into the lake. It was to be a few years before Gramps began to play golf regularly with his best friend, Butch Sletta. My dad, Noel, remarked one time after playing a round with him at the Sauk Centre course, “He’s the only one I know who uses a tee for every shot.” Over the years, Gramps refined his skills. He would purchase a yearly pass at the Sauk Centre Country Club, and eventually garaged a golf cart there. He entered the local tournaments in Sauk Centre, Osakis and Long Prairie. I remember sitting out on the hillside in Osakis, waiting for him to finish. Grandma was always excited and eager to find out how he had done. No matter what Gramps competed at, Grandma was his best fan. While he flirted with par on many an occasion, this always seemed to elude him (even though he averaged a handicap in the low eighties in Sauk Centre. Finally, at the age of 65, he shot a par 72 when he was out with his golfing pal Carl Lemmons at the Landa Park club in New Braunfels, Texas. The cold Minnesota winters were long and arduous. The old house was poorly heated, cold and drafty during the winter. The old wood stove would burn out during the night. By morning, it was not uncommon to find frozen water in the kitchen. There was only the heat thrown off by the chimney upstairs and on cold days the temperature never did get above freezing. Fortunately there were lots of blankets to wrap oneself up in. It must have been murder getting up in the morning, especially when making that first visit to the frozen outhouse! When a snowstorm hit and it was necessary to make a trip into town, Gramps would hook up a team of horses to a bobsled and head out cross-country. When the team got bogged clown in drifts, Gramps would need to dig them out! I’m sure the prospect of a couple of drinks in a warm bar in town helped at least a little. Electricity came upon the scene in 1950. Janice insisted on staying home in order to be the first to turn on the electric lights. Much to her dismay, nothing happened. She had to wait all day for Gramps to come home and arrange to have the wiring fixed. While they were the ‘first on the block’ to install central plumbing, they didn’t say goodbye to the old outhouse until the early fifties. While the forest and lake was rich with wildlife (squirrels, deer, fox, pheasant, duck, muskrat etcetera), Gramps was not a hunter. He was never exposed to hunting as a sport. About the only ‘hunting’ his Dad, Gilbert, would do, was taking his shotgun clown to the slough, sneaking up on the ducks and taking a shot. He would get close enough to kill four or five ducks with one shot. This wasn’t sport, this was food on the table for his family. In contrast, Gramps loved to fish. In the forties, the Sorenson family almost had the lake to themselves. Gramps and Janice would walk towards the point. On a good day, they could almost catch bass at will. The lake also yielded sunfish, crappies and the occasional northern. By the time they were cleaned and fried up by Grandma, it was a mouth-watering meal of fried fish, potatoes and milk gravy that was out of this world. Noel and Jan frequently headed up to the farm on the weekends for a visit, especially in the summer. David and I would follow Gramps wherever he went, milking cows in the morning and early evening, going into town to pick up a part for the machinery, riding on the tractor while Gramps plowed or planted or baled hay. David and I would head out after the cows in the afternoon (although my allergies prevented me from going along at times.) We would holler over and over again, “Come Boss, come Bossie.” Gramps needed to say it only once or twice within earshot of the cows and they came in trotting. David was the consummate fisherman, arising early, patiently awaiting the nibbles and bites of perch, sunfish and crappies. I would sit at the table with Grandma looking out the window. When he hauled in a fish or two, I would run down to the dock and drop my hook in. Invariably, in five or ten minutes, I’d walk back up to the trailer house empty handed. The farm was the perfect place for exploring. We kids would head out into the woods, along shadowed cow paths, imagining ourselves to be intrepid explorers. The homestead seemed huge to us small kids, and we often frightened ourselves with thoughts of wild beasts, or of getting lost. The barn was a magical place. There were so many places to hide in the hay mow. We would climb to the top of the barn and peer out the top. We often found baby pigeons in the nests, but were always careful not to touch or otherwise disturb them (Mom told us that if we did, they would be forever abandoned and die). When Joyce, Bobby, Janice, Barbara, Brenda and Lori were around, there were forts to be made, battles to be fought, teepees to be built and further explorations made. Bobby Gloyd, thinking back, did not have the best judgement of anyone I’ve known. I am amazed that we all survived his supervision. One cold morning in November, he announced that we were going to walk around the lake. The ice had frozen all along the shore to a thickness of an inch or less. It was perfectly clear, and one could see the plants below. We headed out without a thought. At the far end of the lake, Bobby announced that we would have to run fast over a particular section (a small slough emptied into the lake). We ran across as fast as we could, hearing a loud cracking as we went. At the far side, we looked back and could see only water where we had scampered across. Another time, Bobby decided to go ice skating on the slough. We walked carefully, testing the ice to make sure that it was thick enough. Finally, Bobby announced that it was safe. He sat down on the ice to lace his skates, only to have his foot fall through the ice. There were two fresh springs over which only a paper-thin layer of ice had formed. How we avoided falling through and drowning is unfathomable. Another time, Bobby hit a hockey puck out onto the ice. It was again very thin, but for some reason I laid down a sled and carefully pushed myself out and got the puck. It is no wonder that I still occasionally have nightmares in which I imagine myself to be falling through the ice. In the hay mow, we would imagine ourselves to be tightrope walkers and walk high along the beams. Uff da! One day in August, it was harvest time and all of the adults were busy. I don’t recall who was in charge of watching the children, but David, three at the time, at some point decided to go and look for Gramps. By the time Mom came home, David was long gone. Everyone, including the sheriff, searched high and low for David. The afternoon soon waned into evening, and everyone’s heart slowly sank. All of a sudden, the lights of a patrol car came into view. Sure enough, David was in the back seat. Apparently, some family had picked him up from the road and taken him home with them, spending the afternoon with him. They couldn’t have realized the fear that we all experienced, with the knowledge that he might have wandered into the woods, or worse, into a slough and drowned. Christmas at the farm was always something special. Traditionally, Christmas gifts were opened after the cows were milked. Gramps typically milked the cows at six or so. David and I would head out with Gramps to the barn, urging him to finish as quickly as possible. When he finally came into the house, he’d make a great show, taking his time cleaning up. Then we would tear into the presents. One year, there was a special gift. Somehow, Mom and Dad managed to sneak a pony into the bedroom. The gifts seemed a little sparse that year. At last, Buster was led out by the halter with a big red bow on his neck. The only drawback was that the horse wasn’t house-trained! One Christmas Eve, the family was driving back from Little Sauk. It was a cold, clear night. Gramps pointed out the window, declaring that Santa’s sleigh was in sight, led by Rudolf. I stared intently out the window, and at last saw a twinkle that was (probably) Santa and his sleigh (even at age seven or so I wasn’t completely convinced). Later that night, David and I finally fell asleep on a sofa bed. The next morning we awoke, only to find a racetrack assembled on the floor. The plastic track coursed between the legs of the bed, and was all ready to go. I can only imagine how my parents struggled to assemble that gift without waking us. Sorenson Farm taken from the lake about 1990. In 1974, Noel and Jan moved to San Antonio to operate a soda water franchise, Pic A Pop. Within the year, not only Gramps and Grandma, but Larry and Jeri and family, came along to help. Gramps soon became a line operator. Whenever the machinery ground to a halt, he methodically examined the machine, walked to the back of the plant, and found the part that would correct the problem. I remember working next to Gramps when a bottle exploded in front of him. A piece of glass lodged itself in his chest. When Gramps pulled the glass fragment out, the blood spurted out. Gramps didn’t even stop the line, just merely placed, a finger over the bleeder. After five minutes or so, he removed his finger, only to have the blood spurt out once again. This time, he held pressure for ten minutes or so, then put a small bandaid over the laceration. Injuries were just no big deal to Gramps. When Pic a Pop went under, Gramps got a job with the new owner, who opened up a mineral water company, Artesia. Gramps got everything running again, and kept the line going, for little more than minimum wage. He stayed on for three years or so, ultimately retiring at age 65. Gramps loved to give his grandkids tractor rides, even if it was only on the riding lawn mower (1988). Al and Gladys Sorenon on their 50th anniversary in front of South Cross Ranch, Noel Stenoien’s upscale mobile home development in San Antonio Texas (1988). While Gramps suffered from emphysema over the last twenty-five years of his life, he managed to stay pretty active, It was only when he developed temporal arteritis about 1990 that it finally became too arduous for him to enjoy golf with the family. The condition is a dangerous one, with up to a fifty percent mortality. Gramps took high dose steroids for two years. It was here that I had my first exposure to managed care. His doctors elected to forego the usual tests and not monitor his disease at all, primarily for the purpose of keeping their costs down. It is amazing that doctors accept such a system. By not ordering important laboratory tests, his doctors padded their own wallets. I helped Gramps to manage his illness (he did most of it himself) and he finally was cured (the best tincture is often that of time). He was never able to drop the weight off again, although he did lose twenty or thirty pounds from his maximum illness weight (steroids give one a tremendous appetite as a side effect). Gramps couldn’t tolerate many medications, but came to depend upon his ‘breathing machine.’ He received an aerosolized inhaler which brought him great relief from his shortness of breath. He even had a battery-operated machine for his trip to Minnesota. I have feared for the past few years that I would get a telephone call from an emergency room or intensive care unit, only to find out that Gramps was on a ventilator, suffering and in distress. I knew that he was only one episode of pneumonia away from this possible scenario, and each time he came down with a cold, I was worried. I made certain that the kids and I visited the farm in the summer of 1997 to spend some time with Gramps and Grandma. David and Mom came along, David staying for a full two weeks. It was a good, relaxed time. We enjoyed the lake, ate well (steaks, mashed potatoes with gravy, and fresh fried fish), drank beer together, played a ritual game of pool at the bar and most importantly, enjoyed each other. Early in July, Gramps had his worst episode of shortness of breath. An ambulance was called and he was transported to the emergency room. By the time he arrived, however, he was feeling better. It was a tough summer. I remember the heavy humidity in the air, the heat, and the pollen. Gramps continued to have his problems, just not as bad. Finally, on July 24, Gramps awoke in distress. He just couldn’t catch his breath. After a short while, he set back in his chair and uttered a single word, “Gladys. “The worst that I feared had finally happened. Mercifully, though, it happened quickly. Gramps passed away at home with his wife, in front of his beloved lake, and with very little suffering. The day of the funeral dawned brightly. It was a hot day, but the humidity was down. The small Lutheran church in Little Sauk was full for the services. Muriel Myrbo and Bob Lyng sang two duets, Sonja and Theresa a third. I gave the eulogy, and Pastor Peterson gave a sensitive sermon about sports and Christianity (I’m sure Gramps was pleased.., he was never very fond of that particular pastor and we were all fearing a ‘fire and brimstone’ treatise). The congregation sang a favorite hymn of his, something he’d hum to himself from time to time over the years. Gramps chose at the last to be buried by his son, Larry. It was so quiet and beautiful and peaceful. I believe that everyone felt uplifted by the service and interment. Grandma cried tears of relief, and pride. We were all so proud of Gramps. We were all so lucky to share his life. Afterwards, the family headed over to the house. David fired up the grill and everyone scrounged up as much beer as could be found on a Sunday afternoon in Minnesota. The steaks were especially delicious on this fine evening, Everyone had their fill, and by the end of the afternoon, not a morsel was left. I know I had too much beer to drink, and too much food (and I wasn’t the only one!). But after all was said and done, I felt great. I am going to miss you Gramps…we all will. In June of 1998 I took Greg and Kirstin to visit the grave site. It was again a lovely day, cool and sunny, with a nice breeze. We stood in front of Gramp’s headstone and said a short prayer. Kirstin’s comment was, “I hope that Gramps makes lots of friends in heaven, and plays on lots of different golf courses.” I think that he will.